T.N. Tatem Middle School PTA President Amin Smith said, “Most recently it was confirmed that the TN Tatem Middle School has a significant amount of mold that is affecting a great many of the buildings housed on the campus. “We believe that the students and teachers are being exposed to Mold that could potentially lead to a plethora of illnesses, this is our most immediate and pressing concern. “In our meeting with the Minister Wayne Scott JP MP On Dec 1 2016, The Minister acknowledged that mold and the health related ramifications could negatively affect the teaching and learning environment of the school. “The Minister has suggested a staged approach to mold abatement and regularizing the mold problem throughout the school. “We disagree with the staged approach, we believe ridding the school of the mold should be a priority and the mold abatement plan should take place immediately and should be expedited until completion. 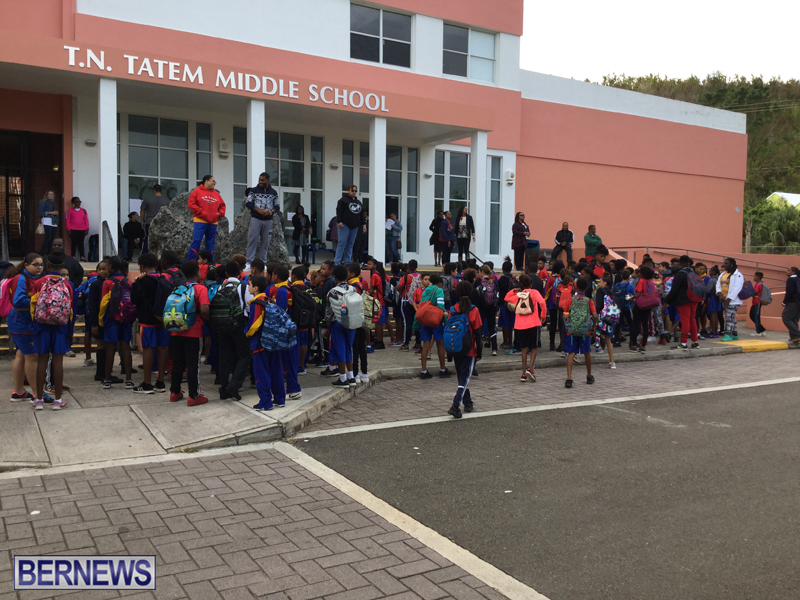 “It is our contention that the Minister should find an alternative facility to house TN Tatem Middle School Students and teachers until after the remediation work is completed. “We would like this issue resolved as a priority. We will consider seeking Injunctive Relief in the Supreme Court and are in the process of seeking legal advice with reference to the same. On Monday the school was closed as teachers did not report to work, on Thursday the Bermuda Union of Teachers held a press briefing to address the building conditions, and on Friday students and staff showed up at school but did not enter the building as a sign of protest over a myriad of health and safety issues. suggestions? You can’t just say “do this” without giving an alternative!! hell no St.David’s has become the welfare parish of Bda ! This isn’t last minute. On Friday when one of us called you to get your consent and then your permission to send your daughter home, it was stated that we, as parents, would not allow our children back into the building – period. Some of us have being searching all weekend for an alternative location for our students/teachers – and hopefully will have good news tomorrow morning to share. I understand your frustration but our childrens’ health is our primary concern. So you want your child in a mold infested class room learning???? are there going to be make up classes on Saturdays? My child, as of Monday, will have missed three school days because of this. If you haven’t realised yet, the unions will leave your kids stuck at bus stops with no notice and will close schools with no notice. You’re the last person they care about. Whatever happened to custodians cleaning the schools. Years ago it was all Portuguese cleaners, to cut the grass and clean the schools, and it got done. Now there are double the staff, they don’t have to cut grass because parks do it, and the schools are filthy. Who is to blame, their supervisors and the school principles for not demanding better standards. Look at our roads, they have sit down mowers with double the staff of what it used to be, and the road ways look horrendous. Who is to blame, the supervisors who don’t demand full working days and quotas per day. Bermuda’s standards have dropped but the cost has tripled due to laziness and bad supervision. Look at the wall at the PriceRite Store in Warwick, over a year and no sign of completion, Why ???? Perhaps again laziness and bad supervision. People have jobs but don’t want to produce. Where are we headed Bermuda, and can we afford this any longer??? As someone whose husband works as a custodian , its not an easy job. Considering you have from 3:30- until 7pm to clean hallways and class rooms . The students dont take pride and care for things as I was taught growing up. I saw picture of what my husband took of a class room how it was left was disgraceful. Further more the teachers stay late so the slows up progress and mold is an issue for a outside company to clean cause you cant just spray bleach on it , they need to get to why the mold has come back. So don’t blame the custodians, when school is out for mid- term breaks the ministry should have someone come in to solve these issues. The custodians at my kids school don’t do a damn thing. They wait for parent volunteers to come in and clean things up. They’re the laziest pair of gits I’ve ever seen. With the worst attitudes. This does not happen over night, mold does not just one day appear!! This sounds to me the problem has been on going and been ignored by the Teachers,Principle,and PTA and maintenance staff! Proof positive these people could care less about their work environment and are accepting none of the blame. Simply irresponsible ! I see teachers teachng how to conceed… how to give up… to quit… and pout… untill they get their way… gimme… gimme… gimme… I want it.. bwaaaahbhh….. bwaaaahbhh.. you prrooommmiiiccceedd…. Man! gt a bucket… get some clorox. and clean up your act… and teach resilience… and how to overcome lifes obstacles! So that you understand, the level of mold and cleaning we are dealing with at TNT is beyond teachers/parents just “sucking it up” and cleaning themselves. It is at a level were professionals are required. Hot water and bleach is not going to cut it; we would be right back at this same position in a few months time. And for the record, parents stopped the teachers and students from entering the building last Friday – the parents. If the mold is in the ceilings,drywall, air conditioning units and vents do you really think clorox is the answer?if it was that simple don’t you think it would be done? The specialists also say clorox should not be used on mold. If you are actually concerned and not just making foolish comments go up there and see what you can do to help. Where are ALL the other schools facing the same issues? You the complainers have children in private schools. You don’t know the struggle. No longer a member you hit the nail. I suggest letting them use the Sessions House. This is an issue, so lets tackle it quickly. Every school should have an annual air quality test. The results should be made public. Corrective action must be be taken immediately. Mold does make you sick. Once the mold situation is eliminated the management of the schools must be held accountable for the cleanliness of the school, even if that simply means recording an potential issues and submitting proper requests for assistance. This situation did not happen over night but let’s not dwell on that right now. Move the kids to Bermuda College. Exams start this week at Bermuda College and they can hold the vast majority of their exams in the two lecture theatres. Ask for help from the prison. I am sure that many of the inmates would be happy to help and this could save on labour costs. These young men do excellent work painting Bermuda College each summer. The good news is you’re providing solutions. The bad news is middle schoolers at Bermuda College during finals puts BC students at a noisy disadvantage and disproportionately long waits in the bookstore and cafeteria when the turn around needs to be the quickest. And how will you change the exam schedule in one/two day(s) and deal with the inevitable conflicts prior to exams beginning? Is Warwick Camp an option? I don’t know the layout. This is not something that has happened over nigh. And the teachers will be working. Let’s just knock them all down and build new ones. There are several private schools on the Island, and I have not heard of any issues with mold in regard to them, do they have a superior maintenance program ? Can some children be moved to Clearwater, some to Somerset Middle School…. the early part of this year, if I am not mistaken, there was concern about school closures..do they have serious mmaintenance issues, or low enrollments. Is thr mold issue real, over rated or non-existent. The Minister spoke quite happily in September, that all was well, did this mold take all by suprise ? Is there an ” incubation period” Will the children suffer bad grades due to the disruption, and possible re-location ? I have taken note, that no one from the Health Department has come on tv to say what is going on ? Parents want to be re-assured, some parents are losing time from work ? I thought the minister said the school was safe. Has anyone considered using Warwick Camp as a temporary facility. Emergency stop until the situation can be resolved? THE BIG PICTURE HERE… IS OUR KIDS.